Innovation Powered by Tradition Powered by over 100 years of piano craftsmanship and 45 years of synthesizer innovation, the CP73 stage piano boasts authentic acoustic and electric piano sound, realistic piano touch and an intuitive one-to-one user interface. CP73 For the gigging keyboardist. 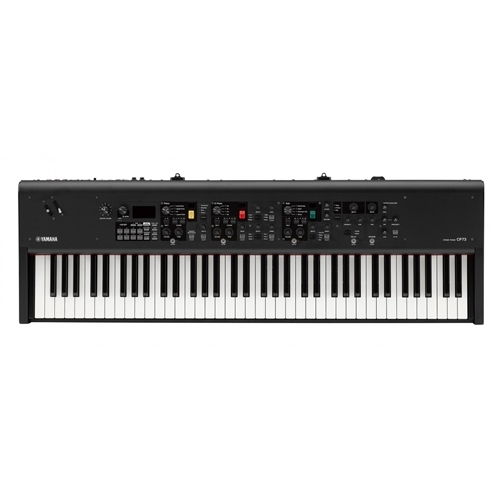 Features Yamaha CP73 | Overview Sound Sound is the most important part of any musical instrument. CP73 stage piano features a wide range of grand piano, upright piano, electric piano and keyboard sounds for playing any music genre. Touch The feel of an instrument is how a musician conveys their uniqueness. CP73 features keyboard action designed with knowledge informed by over 100 years of acoustic piano-making to provide piano players with the action they need for maximum expression. Design CP73 is designed to withstand the rigors of the road and is extremely intuitive to use.